John Christopher "Aidan" Nichols OP (born 17 September 1948) is an English academic and Catholic priest. Nichols served as the first John Paul II Memorial Visiting Lecturer at the University of Oxford for 2006 to 2008, the first lectureship of Catholic theology at that university since the Reformation. 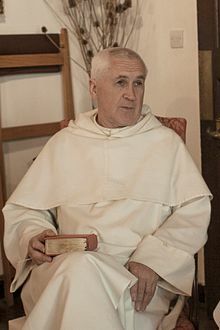 He is a member of the Order of Preachers (Dominicans) and is former Prior and current Sub-Prior of the Priory of St Michael the Archangel in Cambridge. Nichols was born in Lytham St Annes, Lancashire on 17 September 1948. He graduated from Christ Church, Oxford with a first in modern history. Nichols entered the Dominican Order in 1970. He spent the next seven years at Blackfriars, Oxford, during which time he was ordained to the priesthood. He then moved to Edinburgh, where he was a Catholic chaplain at the University of Edinburgh. It was at Edinburgh in 1986 that he received his PhD. Between 1983 and 1991 he was Lecturer in Dogmatics and Ecumenics at the Pontifical University of St. Thomas Aquinas (Angelicum) in Rome. In 1990 he was awarded the degree of Licentiate of Sacred Theology from the Angelicum. In 2003 the Master of the Dominican Order conferred on Nichols the degree of Master of Sacred Theology. From Rome he moved back to England and to Cambridge, where he began as Assistant Catholic Chaplain, then as an Affiliated University Lecturer (1998) as Prior of St Michael's for two terms of office between 1998 and 2004, and again for a third term from 2013. Nichols began his academic work in the Russian theological tradition and has written on many figures including Sergei Bulgakov. However he is best known for his work on Hans Urs von Balthasar, publishing three analytic volumes on von Balthasar's famous trilogy: The Word Has Been Abroad: A Guide Through Balthasar's Aesthetics (1998), No Bloodless Myth: A Guide Through Balthasar’s Dramatics (2000) and Say It Is Pentecost: A Guide Through Balthasar’s Logic (2001). He was also one of the contributors to the Cambridge Companion to Hans Urs von Balthasar (2004), along with Fergus Kerr and Rowan Williams, the Archbishop of Canterbury. He has also written The Theology of Joseph Ratzinger (1988), a book on the theological history of Anglicanism in The Panther and the Hind (1992) and a more general work on religion in the modern world, Christendom Awake (1993). This page was last edited on 14 March 2019, at 01:42 (UTC).